These small round doughnuts are called krapfen or berliner in Europe, and they came to Chile with German immigrants who settled there in the mid 19th century. (Other German treats are also popular in Chile, like kuchen and the stollen-like pan de pascua). 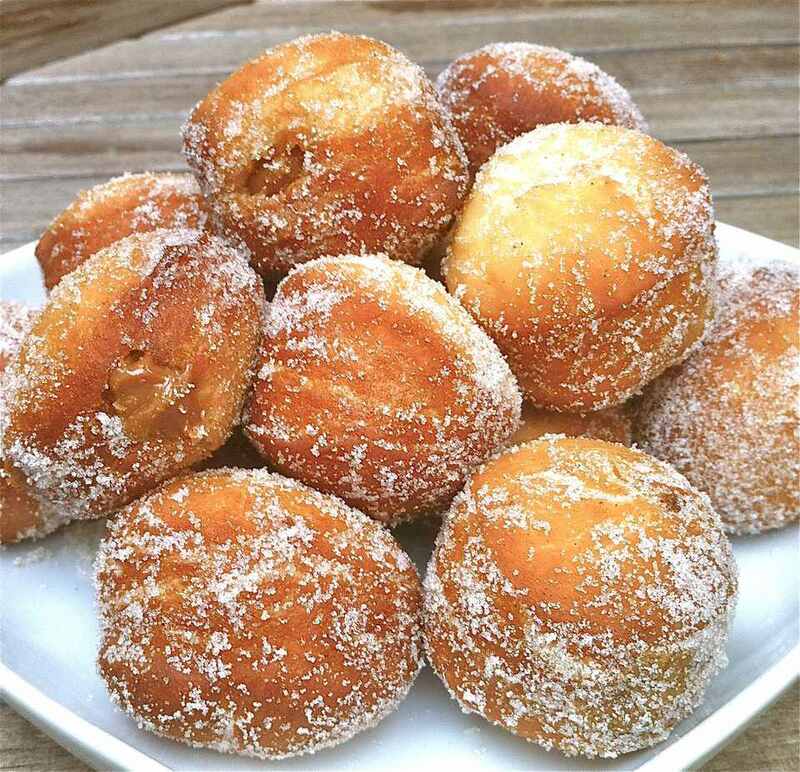 Chileans call these doughnuts berlines and enjoy them midmorning with coffee or as after-school treats. They are easy to make and are delicious filled with dulce de leche (called manjar in Chile). Plain or flavored pastry cream or fruit jams are also common fillings. In a small bowl, stir the yeast into the 2 tablespoons warm (not hot) water. The mixture should turn foamy after a few minutes. Set aside. Add 3 cups of the flour, brown sugar, and salt to the bowl of a standing mixture. Use the dough hook to mix well. Add the melted butter, eggs, yeast mixture, vanilla, anise (if using) and buttermilk to the flour mixture. Knead with dough hook until mixture is smooth, shiny and pulls away from the sides of the bowl, about 5 to 8 minutes, adding the extra 1/4th cup of flour if dough seems too wet. Transfer the dough to a lightly oiled bowl (the dough will be sticky) turning the dough to coat it lightly with the oil. Cover dough with plastic wrap and let rise in a warm place until doubled in bulk, about an hour. Punch down the dough and chill it for several hours in the refrigerator (or overnight) to make it easier to handle. Roll dough out on a floured surface to a thickness of about 3/4 inches. Cut 2-inch rounds of dough with a biscuit cutter and place them on a cookie sheet lined with wax paper that has been dusted with flour. Re-roll scraps of dough and cut more rounds. Cover dough rounds loosely with plastic wrap and lets them rise until puffy (while the cooking oil is heating). Stir the 1/2 cup sugar and cinnamon together in a bowl. In a heavy skillet or pot with tall sides, heat several inches of oil to 350 F. Drop the rounds of dough into the hot oil (working in batches), and fry them until they are puffed and golden brown on both sides, turning them as needed (about 3 to 4 minutes). Remove the doughnuts from the oil with a slotted spoon and cool briefly, then roll each cooked doughnut in the cinnamon sugar mixture. (alternatively, you can dust doughnuts with powdered sugar). Warm dulce de leche gently in the microwave to soften it. Place dulce de leche in a pastry bag fitted with a piping tip with about a 1/4 inch diameter opening. Make a small hole in the side of each doughnut with the piping tip, and squeeze a couple of teaspoons of dulce de leche into the middle of the doughnut. Roll doughnuts once more in the cinnamon sugar and serve. Note: Doughnuts can be reheated in a 300 F oven to restore freshness.